Tomorrow is Thanksgiving, and with that holiday starts for many people a very stressful time of year. For some, tomorrow’s holiday may be less relaxing day off, and more a tension filled exercise in restraint. You know, restraining yourself from telling Aunt Edna what you really think about her vintage coupon collection. 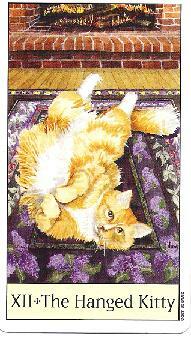 As a bit of a preemptive salve to potentially frayed nerves I found something playful, whimsical, and all around anti-stress inducing, the “Cat’s Eye Tarot” by Debra M. Givin, DVM and published by U.S. Games Systems. I’m not what you call a “cat person”, although Deborah Blake’s house of adorable cats is slowing chipping away at my hardened heart. Yet upon opening up “Cat’s Eye Tarot” the first words to come out of my cold, bitter, cat hair allergic mouth was, “Awwwwww…….how cute!” Yes Givin, a practicing veterinarian, has created an adorable deck of tarot cards. However before you write off “Cat’s Eye Tarot” as some sort of kitschy theme deck possessing no other value than cuddly cat art, let’s go to the accompanying book for some additional insights. 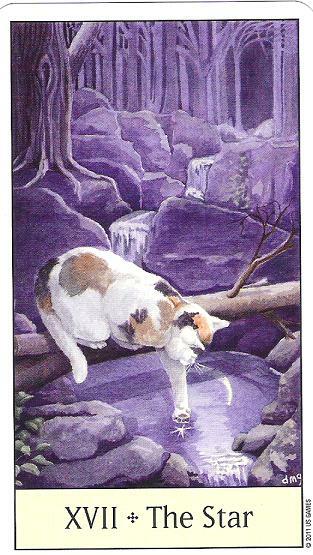 Givin admits that “the images in ‘Cat’s Eye Tarot’ are simple and uncluttered” and that there are “few, if any, esoteric symbols.” Her choice to work with cats was thoughtful and not just born out of affection for felines. She points out that, “cats are pleasing to the eye, complex in their behaviors, and mysterious in their motivation; an idea model for a visually evocative medium like the tarot.” Color in the deck is used to convey suit energies with “solid practical brown tabbies” for pentacles, “sweet black and white” for cups, “talkative Siamese” for swords, and “flashy red tabbies” for wands. Usual suit symbols are replaced with reptiles, fish, birds, and mice for wands, cups, swords, and pentacles respectively. All were chosen because they are natural prey for cats. See? There is a lot more going on here than just some cute cat artwork. But now let’s get to the de-stressing exercise of checking out some of that artwork….. I was enchanted at the way The Fool and The Star not only mirrored the art of the traditional tarot, but managed to capture the feelings those two cards convey. 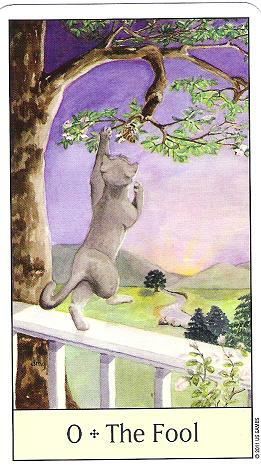 And most readers know my personal favorite tarot card is The Hanged Man, so I couldn’t resist sharing the adorable The Hanged Kitty card. Who’s the cutest little representation of sacrifice? You are kitty! That’s right, you are! Why yes, I did just do baby talk to a tarot card. Wanna’ make something of it? In the fullest of disclosures I must admit to one weird mental hiccup that this Hanged Kitty card triggers in my mind. For some reason every time I say “The Hanged Kitty”, in my horrible mind I think, “hung like a kitty”. Honestly, I’m not sure anyone would ever make the boast of being “hung like a kitty”, but alas it is forever entwined with the beautiful, innocent, and pure The Hanged Kitty card. This review took an odd, and perhaps unfortunate turn…..